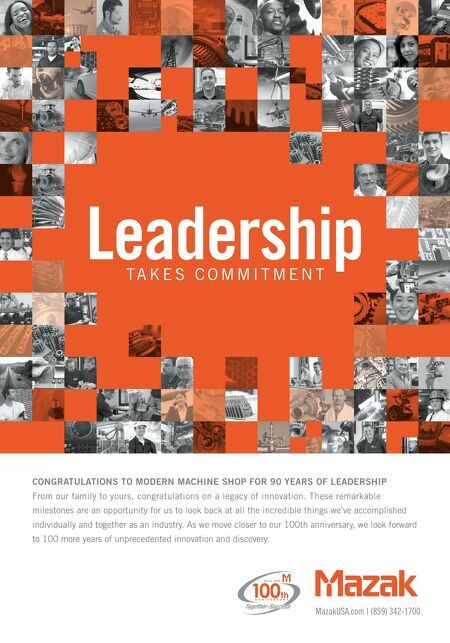 MMS JUNE 2018 74 mmsonline.com PUBLISHER HISTORY Four Generations Serving the Manufacturing Industry Zelinski. This continuity of service has served us well. Each of these editors maintained a clear and consistent vision of our purpose and reason for being. 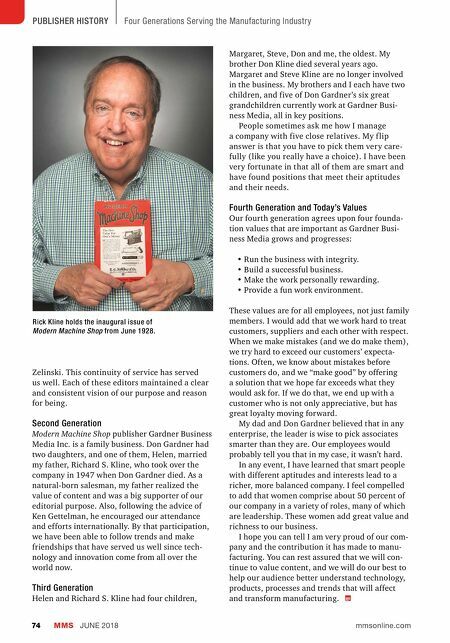 Second Generation Modern Machine Shop publisher Gardner Business Media Inc. is a family business. Don Gardner had two daughters, and one of them, Helen, married my father, Richard S. Kline, who took over the company in 1947 when Don Gardner died. As a natural-born salesman, my father realized the value of content and was a big supporter of our editorial purpose. Also, following the advice of Ken Gettelman, he encouraged our attendance and efforts internationally. By that participation, we have been able to follow trends and make friendships that have served us well since tech- nology and innovation come from all over the world now. Third Generation Helen and Richard S. Kline had four children, Margaret, Steve, Don and me, the oldest. My brother Don Kline died several years ago. Margaret and Steve Kline are no longer involved in the business. My brothers and I each have two children, and five of Don Gardner's six great grandchildren currently work at Gardner Busi- ness Media, all in key positions. People sometimes ask me how I manage a company with five close relatives. My f lip answer is that you have to pick them very care- fully (like you really have a choice). I have been very fortunate in that all of them are smart and have found positions that meet their aptitudes and their needs. Fourth Generation and Today's Values Our fourth generation agrees upon four founda- tion values that are important as Gardner Busi- ness Media grows and progresses: • Run the business with integrity. • Build a successful business. • Make the work personally rewarding. • Provide a fun work environment. These values are for all employees, not just family members. I would add that we work hard to treat customers, suppliers and each other with respect. When we make mistakes (and we do make them), we try hard to exceed our customers' expecta- tions. Often, we know about mistakes before customers do, and we "make good" by offering a solution that we hope far exceeds what they would ask for. If we do that, we end up with a customer who is not only appreciative, but has great loyalty moving forward. My dad and Don Gardner believed that in any enterprise, the leader is wise to pick associates smarter than they are. Our employees would probably tell you that in my case, it wasn't hard. In any event, I have learned that smart people with different aptitudes and interests lead to a richer, more balanced company. I feel compelled to add that women comprise about 50 percent of our company in a variety of roles, many of which are leadership. These women add great value and richness to our business. I hope you can tell I am very proud of our com- pany and the contribution it has made to manu- facturing. You can rest assured that we will con- tinue to value content, and we will do our best to help our audience better understand technology, products, processes and trends that will affect and transform manufacturing. Rick Kline holds the inaugural issue of Modern Machine Shop from June 1928.